Emily and Ellen Mahoney of Basking Ridge, NJ, with their takeout pizza. Ellen is a member of the Junior Friends of Matheny. 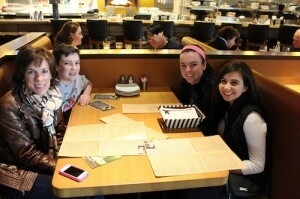 On Thursday, March 19, members of the Junior Friends of Matheny, the youth extension of Matheny’s auxiliary group, patrolled the California Pizza Kitchen restaurant in the Bridgewater Commons Mall in Bridgewater, NJ, handing out flyers for customers to present to their server before ordering. The reason? For every order placed with a flyer, 20% of the check would be given to Matheny. The event raised $348.94 for Matheny. The Friends of Matheny was organized in 1983 by a small group of volunteers and has raised more than $3 million since then, providing funds for recreational and therapeutic activities as well improvements and enhancements to Matheny’s physical facility. The Junior Friends consists mainly of high school students at both Ridge High School in Basking Ridge, NJ, and Bernards High in Bernardsville, NJ. However, some students who graduated, went off to college and returned to the area have remained active in the organization. 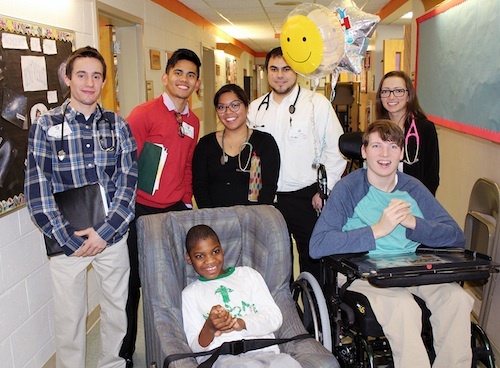 In addition to raising funds, the Junior Friends participate in Matheny events such as the annual prom and provide special programs for Matheny students and patients during holidays such as Christmas, Halloween and Valentine’s Day. Clockwise, from left: Sharon, Aidan and Georgia Tompkins and Sarah Desatnick, all of Basking Ridge, NJ. Georgia and Sarah are members of the Junior Friends of Matheny. From left, Arts Access visual arts coordinator Andrew Edge, Adults Services instructor and director of the ceramics program Jodi Miguel and Verve owner Rick St. Pierre. 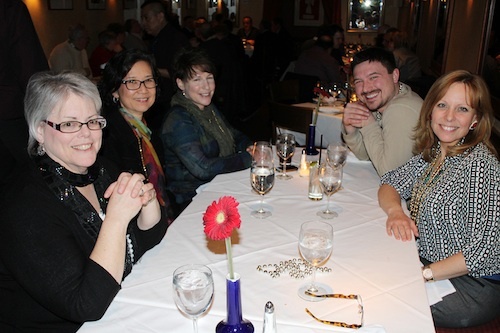 Despite some nasty weather in February, the Verve Bistro’s Mardi Gras celebration for Matheny raised $2,000, which owner Rick St. Pierre asked be divided between Matheny’s Arts Access Program and the Adult Services Ceramics Program. The funds were raised from a mask auction and a portion of the proceeds at the restaurant from Fat Tuesday, February 17 through Sunday, February 22. Many Matheny staff members and adult patients made Mardi Gras masks, which were auctioned off on the 22nd. Arts Access enables individuals with disabilities to freely express themselves through visual, literary and performing arts. The Adult Services Ceramics activity teaches adult residents and day health services patients the fundamentals of working in clay, incorporating the elements of design and principles of art. The Fitness Walk is one mile but can be doubled to two miles if you continue on in the Wheelchair Walk. This year’s Miles for Matheny will feature a new Fitness Walk, a one-mile walk held just before the Lu Huggins Wheelchair Walk. You can walk at your own pace, or power walk, and when the first mile is finished, you have the option of going the extra mile by joining in with the Wheelchair Walk. The 18th annual Miles for Matheny will be held on Sunday, May 31, at Liberty Park in downtown Peapack. In addition to the Fitness Walk and Wheelchair Walk, there are five Cycling routes and a Kids Fun Run, all preceded by The Friends of Matheny’s “Breakfast of Champions.” All funds raised at Miles for Matheny will benefit programs and services that enhance the lives of the children and adults at Matheny and serve people with disabilities in the community. For more information, or to register, log onto www.milesformatheny.org or call (908) 234-0011, ext. 260. “Plays by People,” a performance of original dramatic works by Matheny’s Arts Access playwrights, will be part of the New Jersey Theatre Alliance’s Stages Festival, the state’s largest annual theatre festival which provides discounted and free theatre performances, workshops and events for all ages throughout the month of March. The performance will be held at 6 p.m. on Saturday, March 28 in the Robert Schonhorn Arts Center on the Matheny campus. It’s free and open to the public. It will include staged readings of short plays written by Arts Access playwrights with disabilities and performed by Equity actors and Kean University’s Premier Stages professional theatre staff. The playwrights will be an integral part of the staging process, directing and instructing the actors as to how to present their work. The six playwrights are: Cheryl Chapin, Jess Evans, Amanda Kochell, Taty Manousakis, Natalia Manning and Cindy Shanks. The Stages Festival offers more than 100 performances, workshops, classes and events at the state’s professional theatres, performing arts centers, libraries, schools, senior centers, museums and other community venues. The program was developed to encourage New Jersey’s residents to attend their local professional theatres by making the experience more affordable, accessible and fun. Team Melvin at last year’s Miles for Matheny. Now is the time to start forming a fund-raising team for Miles for Matheny. Your team could include members of your school, church, book club or workplace—or it could just be family and friends. You can decide what Miles events you want to participate in and then create a team registration page. Set team fund-raising goals or generate a friendly competition among team members to see who can raise the most money. 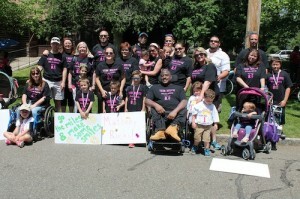 To make your fund-raising efforts easier, you can create a team webpage at www.milesformatheny.org. Just upload photos of you and your teammates, set your fund-raising goals and send emails to your contacts, asking them to support you at Miles for Matheny. 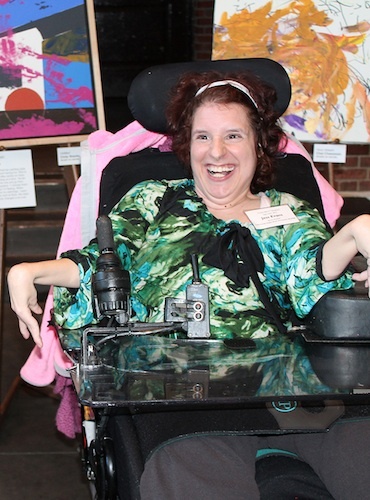 Funds raised at Miles for Matheny will benefit programs and services that enhance the lives of the children and adults at Matheny and serve people with disabilities in the community. 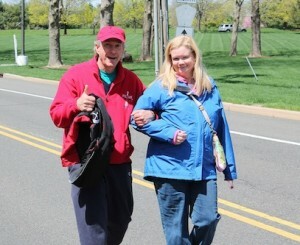 For more information, log onto www.milesformatheny.org or call 908.234.0011, ext. 260. 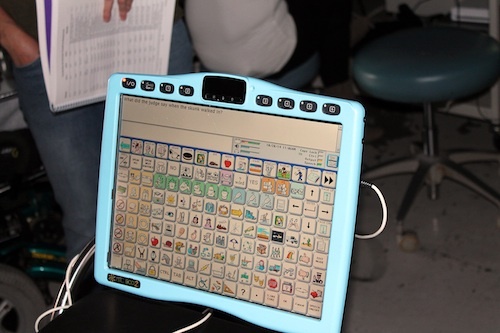 An example of one of the more sophisticated communications devices that help non-verbal Matheny adults and children communicate. Matheny recently received a three-year accreditation from CARF, an independent, nonprofit accrediting body that establishes consumer-focused standards to help organizations measure and improve the quality of their programs and services. The CARF accreditation indicates that Matheny has put itself through a rigorous peer review process, demonstrating to a team of surveyors, during an on-site visit, its commitment to offering programs and services that are measurable, accountable, and of the highest quality. Rutgers OTA student, Angela Verdi, left, with Matheny COTA Debbie Goodhart. Matheny works with several colleges and universities to provide occupational therapy and occupational therapy assistant internships. Rutgers University began an OTA program in 2012, and its students have been coming to Matheny for seven- or eight-week sessions, shadowing our certified occupational assistants (COTAs) in a real working environment. The OTA interns receive practical experience interacting with patients and students and practicing techniques and theories related to occupational therapy in both a hospital and school setting. 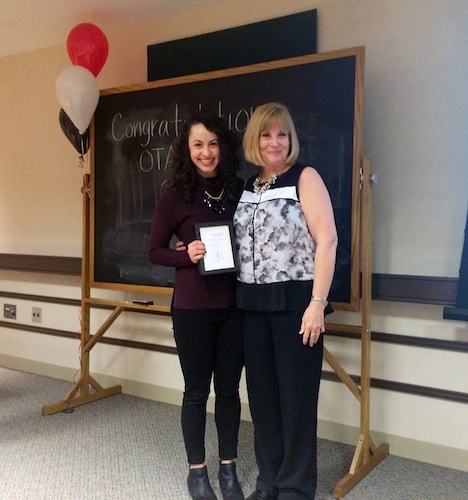 The Rutgers Associate of Science – Occupational Therapy Assistant program was begun in the School of Health Related Professions (SHRP) in response to a national, state and local demand for OTA practitioners and is supported by a grant from Genesis Rehab. Occupational therapy is a health and rehabilitation therapy that helps people develop and build skills that are important for independent functioning health and well-being. At Matheny, OTs are part of a collaborative team that helps develop adaptive skills and assists in improving performance capacity in individuals whose ability to perform life skills is impaired. Standing, from left, nursing students Bret Tokash, Jerome Bautista, Kathleen Duncil, David Hummer, Kelly Richard. In front, from left, Matheny students Jameir Warren-Treadwell and Shane Szott. “We learn how to administer medications and communicate with non-verbal patients. It’s a challenge, but it’s been a really good experience coming here.” That comment by Bret Tokash of Stockton, NJ, was typical of the reaction of his fellow Raritan Valley Community College classmates, all nursing students who visit Matheny regularly as part of our sponsored nursing school program. Affiliations with nursing schools such as RVCC’s have created a greater nursing community for the special care that Matheny’s population requires. And the nursing students are a source of recruitment for Matheny’s nursing department. Because of the diverse needs of Matheny’s patients, nurses have to be knowledgeable and competent in a broad spectrum of practice applications. 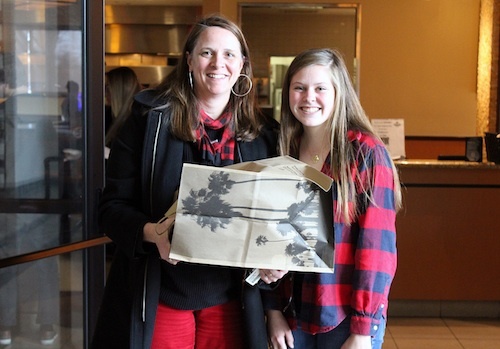 • A story on Matheny’s Thanksgiving festival by Jessica, Kathryn and Savannah. 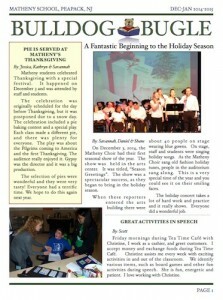 • A report on the holiday concert by the Matheny Choir, written by Savannah, Daniel and Shane. • An alphabetical advice list written by graduate Raven, who also served as co-editor. Click here to download and read the entire Bulldog Bugle. 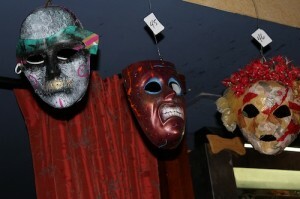 Some of the many masks that were auctioned off. The bar and dining room at Verve Bistro in Somerville, NJ, was packed on February 18, Fat Tuesday, for the kickoff of the restaurant’s Mardi Gras With Matheny celebration, which continued for four more days, from February 19 thru February 22. The festivities included a mask auction, which began with silent bids on Fat Tuesday and culminated on the final day, along with a gumbo cook-off. There were also plenty of flashy decorations and trinkets, along with the traditional Mardi Gras beads. Mask sales on Sunday, February 22, totaled $1,200. That, combined with partial proceeds from all five days resulted in Verve making a $2,500 donation to Matheny. Matheny staff and students contributed to the effort by making most of the masks that were hanging for sale in the bar area. 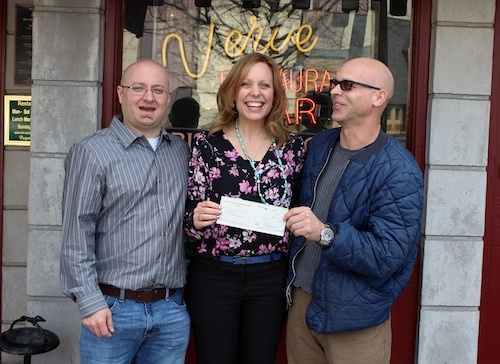 Verve owner Rick St. Pierre is well known as someone who gives back to the community. In fact, in 2011, he was Somerset County’s citizen of the year. Thank you, Rick! Some of the Matheny mask makers, clockwise, from left: Donna Sykes, Center of Medicine and Dentistry clinic manager; Haeree Park, Arts Access project and event coordinator; Eileen Murray, Arts Access director; Burt Brooks, Arts Access performing arts coordinator; and Jodi Miguel, adult services instructor.